This is the first of two interview columns on Julia Galloway. A third column featuring her work will be a step-by-step photo process showing her work on a piece, plus some of her glaze formulas. Presently, Galloway teaches at the School for American Craft at Rochester Institute of Technology in Rochester, New York, but her pottery experience dates back to high school. Wilson: I understand you have taken a long and varied route to become a potter. Tell us about it. Galloway: I started making pottery in high school. At Brookline High [in Massachusetts], there was a separate building called the Manual Training Building. It was a refuge from the complication and chaotic time of my adolescence. I had a wonderful pottery teacher, Mr. Lane, who let me come and go as I pleased. I got the act of throwing pretty early, and in high school, it was a bit of a miracle to me that I was good at anything. When I was a senior, Mr. Lane suggested that if I wanted to make pots, I should go to Alfred University. He helped me shoot slides of my pots and the following fall, I moved from Boston to a small town in New York State. At Alfred, I received an intense education, but the most important part of my time there was that I learned how to work and developed a self-confidence that I could do anything. After undergraduate school, I went to study in Japan. I had been very interested in Japanese pottery and very much wanted the romantic, quiet life of the unknown craftsman. When I was in Japan, I had a bit of a crisis of identity. I saw so many wonderful pots there, I felt like all the good pots had been made, and I realized-to my shock-that I was truly American. I also realized that despite how hard I tried, there was very little in my personality suited to be a humble, unknown village craftsman. When I returned, I wandered around, trying to figure out what to do. For two years I stocked produce at the Boston Food Co-op. This was wonderful training for a potter. All day long I arranged beautiful forms, shapes, colors, and textures. How beautiful green leaf lettuce looked lined up next to orange carrots and rutabagas. I also enjoyed the brute labor of the job. It was tremendously satisfying to me, going to bed tired after a good day’s work, arranging ripe melons and green peppers. After some time, I enrolled as a special student at Massachusetts College of Art. When I was at Mass Art, it was kind of wild. There was a group of us that worked all the time, day and night, and we spoke about ceramics constantly. I had almost no classes and put miles on my hands that year. They just let me make, and I began to believe in my own process of making and rebuild my confidence in being a potter. I also embraced my newfound-rather than adopted-sense of beauty. The next year, I went to the University of Colorado in Boulder because I wanted to study with Betty Woodman. While I was there, I thought I could single-handedly resolve the difference or conflict between art and craft. I was a difficult student, rather contrary and confrontational. In an effort to make traditional craft in a fine arts school, I had to learn how to speak about all work-all kinds of work-to be taken seriously. I became much more interested in what different kinds of work were about, rather than what category they fell into. During my time at Boulder, I fell off my bicycle into an irrigation ditch, and seriously broke my wrist. I could not throw at all, but had the good fortune of a kiln-load of bisque ware in my studio, so I started to glaze. And I glazed and glazed those pots and fired them again and again. I fired pots high-fire and then fired the same pots again low-fire. It was then that I began to work with surface decoration and was set free from some old, learned rule that pots were all form. During my time in graduate school. I attended the Nova Scotia College of Art and Design. I knew that I needed to work with more potters and I wanted to be surrounded by knowledge of historical pottery. In Canada, they asked me what my pots were about. So I realized I needed to search for an aesthetic that was more my own. Wilson: Are you always looking for that slightly new thing in your work, that’s a slight change? If so, is it design, or technique, or something else? Galloway: By nature, I am not always adventurous and I always need a deadline to get things done. It is the energy from the anxiety and pressure of deadlines that helps push me. Working under a bit of pressure, I make different decisions than when I have all the time in the world. It seems like, about once a year, I look down at what I’m making, and I am bored, bored, bored. I know what is going to happen and the forms become dull and the surface lazy. Then I bump around a little in my studio, recycle clay, mop the floor, complain to friends about the state of the world. Then I get restless and find a little thread, a tune, words in a song, a new technique, an odd glaze result, a personal or world event. Then I am in the thick of it again. Wilson: What is most difficult about your work? which processes do you love the most and which would you love to skip? Galloway: I would love to skip the selling part. Creativity and commodity are not great bedfellows. Dealing with the financial end of things makes me tense. Sometimes the prices seem much too low, other times much too high-even when the price is the same. It is not that I do not value my work. I think it is worth good money. There is a lot of careful labor and constant consideration in each pot, but I don’t really know how to put a monetary value on that. Mostly I look around at other potters’ prices and try to gauge where I fit. I made a living off my work before I became a teacher. I had thought that making a living from my pots would help me understand this better, but mostly it just made me tense, defiant, and resentful. Wilson: Tell us about keeping your own work going while teaching. What do you get from teaching besides a paycheck? Galloway: Being a full-time teacher and making fresh and interesting work is barely sustainable. I decided to teach because it was the right time. I have the energy to do this right now. Sometimes it is draining, I get frustrated with my students when they are wasting time, I get jealous. Sometimes I like being right there next to them, working along with them in their discoveries. The balance of teaching, making, personal care, and community is impossible. I am not particularly good at it, and am almost always late for everything, though my intention is to be on time. If teaching were just a paycheck to me, well, I would find an easier way to get a paycheck. Since I have been teaching, I have never worked so hard, with so many parts of my psyche. And-daily-I am amazed by how much I learn from the students, and how differently people see the world. I am pressed to continually reassess my own value systems and realize that teaching is the best way to really learn something. Lana Wilson is a Del Mar, Californla handbuilder who teaches at Mesa College Extension, Mira Costa College, and gives frequent workshops. 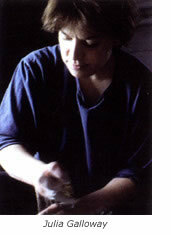 She is also the author of Ceramics: Shape and Surface. Visit her Web site at www.lanawilson.com.